Revenues of the US engineering industry have rebounded since 2015 after some years of decrease, as greater liquidity in financial markets helped to boost spending on new construction. Businesses’ profit margins have increased over the last 12 months, and are expected to remain stable in H2 of 2018 and H1 of 2019. The US machines/engineering sector is forecast to record value added growth of 7.2% in 2018 and 4.5% in 2018. 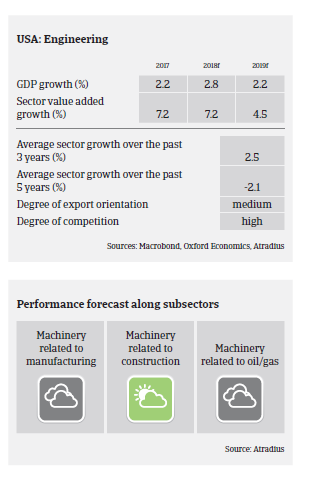 Construction-related machinery businesses continue to benefit from elevated US economic growth and the continued robust performance of the domestic construction sector. Quality engineering products will remain in very high demand throughout most industrial segments in 2018 and 2019. While the machinery businesses related to the oil/gas or the mining segments had been affected by lower capital spending on purchasing machinery and equipment in 2016 and 2017, higher oil and gas prices have led to a modest rebound in investment since the end of last year. In general the dependency on bank financing of this capital-intensive industry is high, and US banks are principally willing to provide loans to the sector. The average payment duration in the US machinery industry is 30 days, however, payment terms can be longer as capital equipment can carry a higher price tag. Payment experience over the last two years has been good, with a rather low number of non-payment cases expected to decrease further in the coming six months. Compared to other US industries the number of insolvencies is low in the machinery sector. Business failures have decreased in H1 of 2018 and are expected to level off in the coming 12 months, in line with the overall US business insolvency development. Due to the rather moderate credit risk, our underwriting stance for the US machinery sector is generally open. However, some caution is still advised on machinery businesses dependent on the oil/gas and the mining industry, due to the potential impacts of energy price volatility and of the increased importance of environmentally friendly and sustainable energy sources.